Lürssen is renowned for building all classes of high-quality naval vessels for the German Navy and other international navies worldwide. No other shipyard in the international market has developed, built and delivered so many naval vessels to so many countries. As part of its excellent and comprehensive services, Lürssen provides logistic support for its entire portfolio of naval vessels. With a proven track record, Lürssen owns the facilities to build and support ships between 20m and 200m using the most advanced shipbuilding technology. Lürssen provides numerous solutions for its customers to ensure each naval vessel continues to operate at its peak throughout its lifecycle. It offers a range of services, including production of detailed documentation, reliable supply of spare parts, effective training, as well as the maintenance, repair, and refit of any vessel to maximise its potential. The company’s highly efficient services are available for any vessel, whether it has been built by Lürssen or by another shipyard. Lürssen also assists in establishing maritime infrastructure and integrating ships with other platforms, systems and facilities. Lürssen has successfully built myriad high-speed crafts since 1905. These particular vessels can quickly respond to any challenge, offering top speeds of more than 40 knots. The units are ideally suited for securing and patrolling a country’s coastal waters and can be deployed during an emergency or disaster crisis, as they are high-performance and have excellent seakeeping characteristics. They are also suitable for local naval operations in territorial waters. Lürssen OPVs are multi-role platforms built to provide permanent maritime security in operational areas due to their long endurance and excellent seakeeping capabilities. Most suitably used for protecting offshore installations, guarding fish stocks and other natural resources, as well as search-and-rescue operations, their basic design can easily be adapted and upgraded to suit individual needs and handle specific challenges. This can include rapid interception of smugglers, pirates or terrorists by way of rigid high-speed inflatable boats (RHIBs) that are carried on-board. Equipped with sophisticated combat and weapon systems, Lürssen corvettes can play an essential role in any naval flotilla. 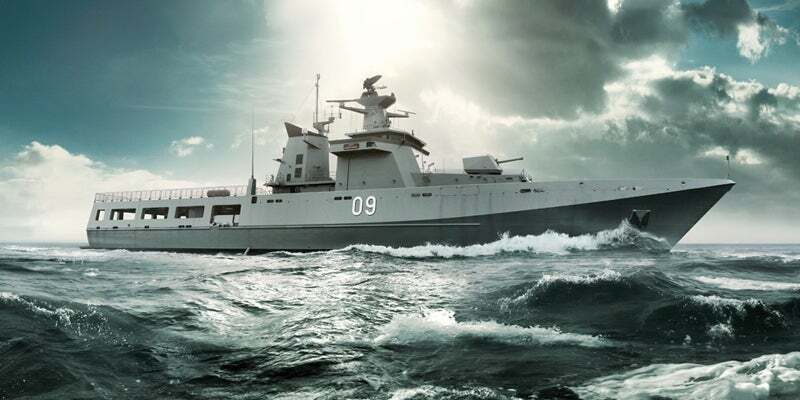 Impressive features such as stealth capability and automated weapon systems make these medium-sized vessels ideally suited for crisis management, maintaining security in territorial waters and combat operations. Lürssen frigates are capable of independently carrying out several types of missions, including maritime surveillance, anti-submarine warfare, anti-surface warfare, or air defence. These vessels also serve as a network ship in joint and multi-national assignments. In formation with naval support vessels and fleet logistics, Lürssen frigates can operate worldwide, wherever they are needed. Lürssen minesweepers and minehunters are worldwide leaders in their class due to the high level of unit protection, integration of sophisticated mine countermeasure systems (MCM), and their advanced construction materials. The non-magnetic steel with which they are built guarantees important tactical advantages as well as effective protection from possible fire and explosions. Lürssen designs and builds supply and auxiliary vessels of all types and sizes to support naval fleets that are undertaking ‘out of area’ operations. Lürssen naval support vessels are able to supply fuel, food provisions, ammunition, and spare parts to ensure the continued operational readiness of the naval fleet. These vessels also support the combatant fleet with special repair facilities and feature an on-board hospital for use in disaster relief operations. With more than 140 years of experience, clients can rely on Lürssen to build and deliver naval vessels of the highest quality, as well as offering all services needed to keep any ship at operational readiness. As a family-owned business, Lürssen is able to make decisions quickly without outside influences and this is unique in the international market. This is important for customers as Lürssen is completely flexible in the choice of technologies and systems that can be integrated into vessels. Lürssen has established an excellent worldwide operating network with long-term partner companies in more than 15 countries. This enables them to optimise the integration, performance and quality of each vessel and to meet the specific requirements of their clients worldwide. The Lürssen Group Headquarters are located in Bremen, Germany, which it coins as its centre of development, design capability and shipbuilding competence. There are seven Lürssen locations in total, staffed with highly qualified personnel for the dedicated building of new naval ships. Moreover, several of these shipyards specialise in repair, refit and modernisation of all types of vessels. The geopolitical situation has become more diverse over the last one and a half years and the momentum for a sound strategical sovereignty has re-emerged. This video gives a brief description of the Lürssen Offshore Patrol Vessel.